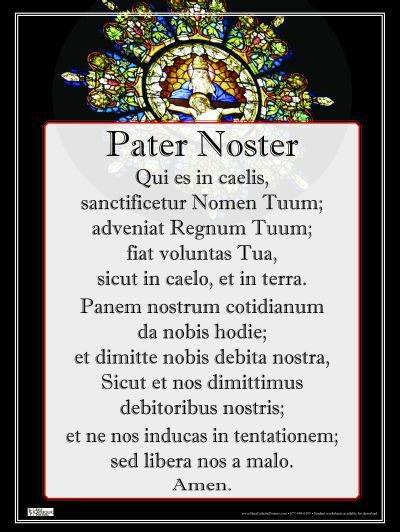 Holy Card - Seven Sacraments Holy Card - 7 Sacraments  - $0.30 : Best Catholic Posters, Get the Catholic Perspective! A brand new way of envisioning the Seven Sacraments! 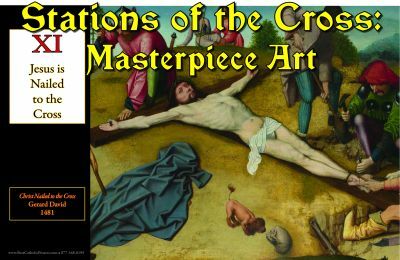 See How They Conform Us to the Cross of Christ! 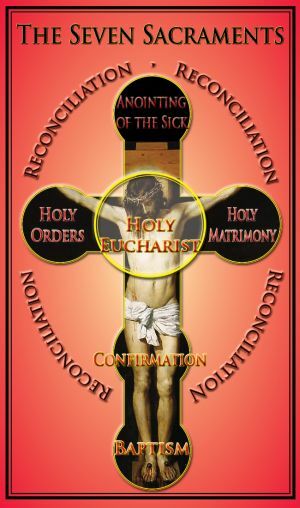 As we all know, the seven sacraments draw their power from the power of Christ's Cross, and the Eucharist is the sacrament most closely united to His saving work. 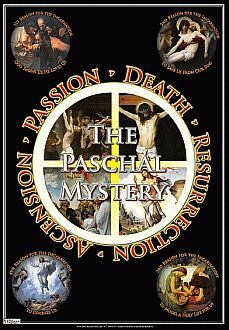 For years, artists have tried to adequately explore this great mystery. Today, we have yet another attempt to plumb its depths, and this one mirrors the heart of the Church! 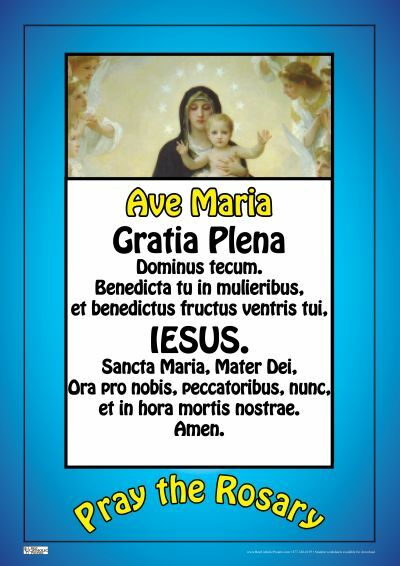 This doctrinal holy card imitates the 19x27 wall chart poster - a masterpiece of catechesis! It begins with Baptism, the gateway sacrament, found at the foot of the Cross. Baptism gives us enormous grace, and allows us access to the ladder of the Cross, so that we might ascend to heaven through its power. But, while Baptism begins the work, the work of initiation is far from over. From Baptism, we ascend to Confirmation, wherein the Church, the Bride of Christ, imparts to each of the baptized the strengthening grace necessary for us to be fully equipped against the darts and arrows of the evil one. Because Confirmation is usually given many years after Baptism, most of the baptized must first receive the sacrament of Reconciliation in order to be fully prepared and open to the graces that are bestowed, and to the imperishable seal that is imparted. The high-point and cap of the Sacraments of Initiation is the Eucharist, the intimate union with Christ Himself. As Jesus Himself tells us, we must eat His flesh and drink His blood to have eternal life. Radiating out from this central sacrament of the altar, are the two sacraments of service. On the right of Christ is Holy Orders, the sacrament Jesus instituted at the same time He instituted the Eucharist. On that Holy Thursday night, He washed His apostles' feet, to remind all priests and bishops that they rule by serving. On Christ's left, in the other place of honor, is the sacrament of Holy Matrimony. Marriage is the foundation for the domestic Church, the font from which springs all future nuns, sisters, brothers, monks, priests, and bishops. Without these two sacraments of service, the Church would surely fail. But She does not fail for we return continually to the Eucharist, Who strengthens each of us in our own lives and vocations. As we reach upward towards God, He empowers us to live the Cross as He did. Our illnesses and serious physical sufferings are sanctified by the Sacrament of Anointing of the Sick. In our final Cross, our final illness, God anoints us with His grace once more in this final Sacrament. In this sacrament, we receive pardon not just for our sins, but we receive the apostolic pardon, the remission of all punishment that would otherwise justly be required of us for our sins. Through the sacrament of Anointing of the Sick, we are empowered to enter directly into heaven itself, to meet Christ. It is the crown of the sacraments, through which we receive Viaticum, our last reception of Eucharist, the waybread of Life that strengthens us to pass through the doorway of death. Because the Cross reconciles, the sacrament of Reconciliation is woven around every sacrament. It is even embodied within the entry and exit sacraments (Baptism and Anointing). Reconciliation is a small doorway, a little death, a short practice and practical preparation for the final encounter with God. In each celebration of Reconciliation, we practice walking through the doorway of death to meet Christ for good and all. These are the Seven Sacraments. They conform us to the Cross of Christ. Teach these things to all who have ears to hear. Sacraments of initiation start at the foot of the cross and lead us to the heart of the Cross. Baptism introduces us to the foot of the Cross. Confirmation perfects the gifts of baptism and raises us up higher on the Cross. Eucharist perfects us as Christians and introduces us to the heart of the Cross. Once we have been introduced to Christ's heart and are fully initiated, we are ready to be empowered to do Christ's work, ready to be His hands. On Christ's right hand is the sacrament of Holy Orders. 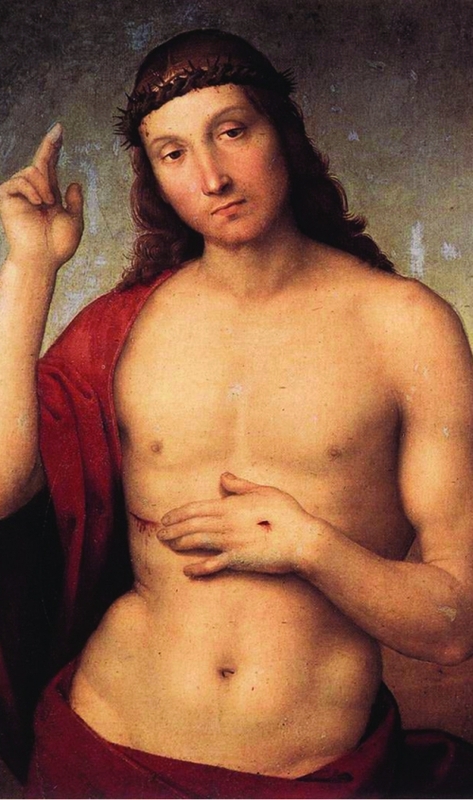 On Christ's left hand is the sacrament of Holy Matrimony. These are the sacraments of service, the hands of Christ. To encounter Christ we need to be healed of our sins, so wrapped around each sacrament like a bandage is the sacrament of reconciliation. He always heals us so that we can participate in His work, so the healing of sins is the only proper preparation for every sacrament. Before we enter the perfection of heaven, we need to be fully healed of our illnesses, and that is what Anointing of the Sick does. It is the ultimate healing as we climb the ladder of the Cross and step through the doorway of death into heaven itself, to dwell with God in perfection forever. 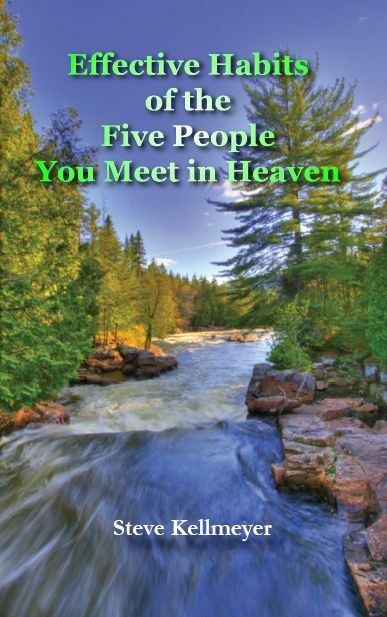 A brand new way of envisioning the Seven Sacraments! See how they conform us to the Cross of Christ! As we all know, the seven sacraments all draw their power from the power of Christ's Cross, and the Eucharist is the sacrament most closely united to His saving work. 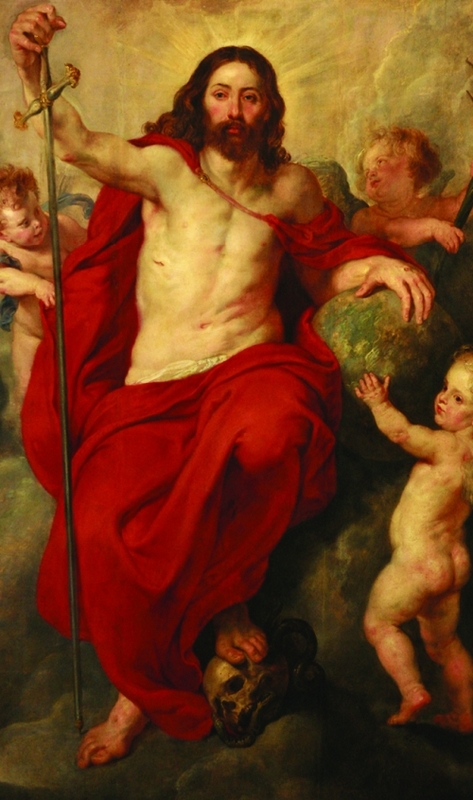 For years, artists have tried to adequately explore this great mystery. Today, we have yet another attempt to plumb its depths, and this one definitely stays close to the heart of the Church!